An audience of academics, students, local politicians and members of the public gathered at the UEA on Wednesday 11th September to hear two very different perspectives on scales of action for climate change. The public forum was the opening event in this year’s Tyndall Centre Assembly, and the University of East Anglia’s 50th Anniversary Lecture, and Gill Seyfang was one of the plenary speakers on that panel. 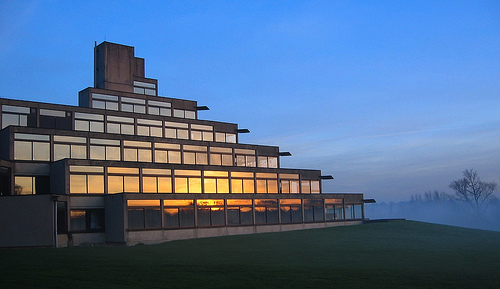 The theme of the 2013 Tyndall Centre Assembly at UEA was sharing and learning about how to do research for decision-making at differing scales of policy. Dr Gill Seyfang presented new research findings about the potential of small-scale community-owned renewable energy initiatives to contribute to sustainable energy transitions, and the challenges to be overcome. This complemented the introductory talk, by John Ashton CBE, who discussed the limits of what is possible on climate change action, and whether we are facing the end of progress. Following the main talks, the speakers took questions from the floor for an in-depth discussion covering the potential for social media to enable greater citizen action, the role of ethics and role modelling in academics and scientists, and the scope for fracking to confound our best efforts towards sustainable energy. Prof Bob Watson chaired the event, and UEA’s Vice-Chancellor Edward Acton offered optimistic reflections at the end of the forum.